Divine Divas Inspiration Challenge #13! My layout was inspired from the picture, as well as the trees. I used my SU set Trendy Trees, stamped the center one, masked it and stamped the other trees. Then I decided to stamp the center tree again, cut it out and pop it up on Dimensionals. After I cut out all the squares, and laid them out, I stamped the sentiment from the PTI set Fall Elegance. I ran the squares through my Leafy Branch CB Folder which was inspired by the branch in the left corner of the picture, before adhering them to the card base. I added the ribbon and popped up the center image panel. Make sure you check out what the other Divine Divas did this week! If you decide to play along with us, just use DDIC13 when uploading : ) Thank you so much for stopping by! So Lovely! I love the bands separating the squares, and the trees in the center are so sweet....I really like this set...and popping up the single orange one is so smart! Really calls attention to the center. Truly inspired!! 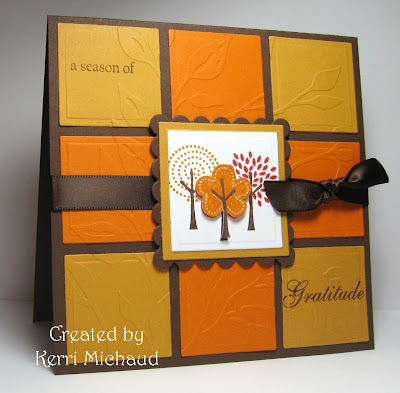 Great job with the inspiration Kerri, I love your color choices, embossing and I sooooo love that set! Beautiful fall card Kerri and i love how you have made windows using squares. Wow... I think I have said "wow" to everyone's card today! :) I love your embossing on the squares - perfect touch - and the trees in the middle are wonderful. The sentiment is also fabulous stamped in opposite corners. This is really beautiful! What a wonderful card, Kerri! I love the blocked squares and the embossing is perfect for this. Those little trees are super. Wowzer Kerri!! Love your card!! Great use of the color blocks and the trendy trees set!! That embossing is gorgeous!! Oh my...I just love this one, Kerri! Your embossing is gorgeous, and I especially like the way you used so many elements from the inspiration piece but still managed to give it an entirely different feel. Oh I don’t know how you do things like this - - and make them look soo good…sooo straight! Love the colors too - - that dark mustard is really nice. Wow!! Love the embossed squares and the inspired layout is fabulous!! I just love all the warm colours and the embossing and that ribbon! Just fabulous!!! This is a really pretty card! Nice job. This is so pretty. It's lovely all by itself, and I love seeing it right next to the inspiration piece. Brilliant! That cuttlebug folder is perfect for this. And I love the edges on the squares...more interesting than plain old squares! Wow! What a stunning card! Love everything about this card! Great take on the inspiration piece and LOVE those trees!